At Bernell Hydraulics, we have all the hydraulic parts you need to keep your system in top condition. Plus, we have the skills and experience needed to install these parts and to provide superior service for all kinds of hydraulic equipment, including mobile, industrial, agricultural, and custom applications. Please give us call and let us know if you need our assistance with hydraulic parts & service in Wilmington CA. Because we provide both hydraulic parts & service in Wilmington CA, we can actually help make your parts and your equipment perform better and last longer. We do this through important maintenance services like fluid analysis, fluid flushes, filter changes, and system analysis that help keep your hydraulic equipment performing its best. We even offer 24 hour mobile repair services, so we can repair your hydraulic equipment right at your job site to get you back to work faster. To learn more, please contact us. 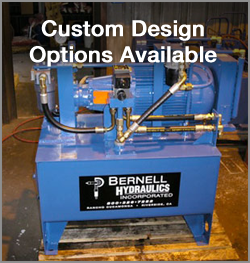 As a manufacturer of custom hydraulic systems, Bernell Hydraulics is ideally positioned to provide hydraulic parts & service in Wilmington CA for custom equipment. We can create custom replacement parts and install them for you.